When it comes to New England style garden offices, the company you want to talk to is Timeless Garden Rooms. They are known for their traditional style, painted garden buildings that ooze charm and traditional detailing. Normally their designs feature a pitched roof finished with Cedar shingles. We were, therefore, interested to see photos of a mono pitch / virtually flat roof design pop up in our inbox. 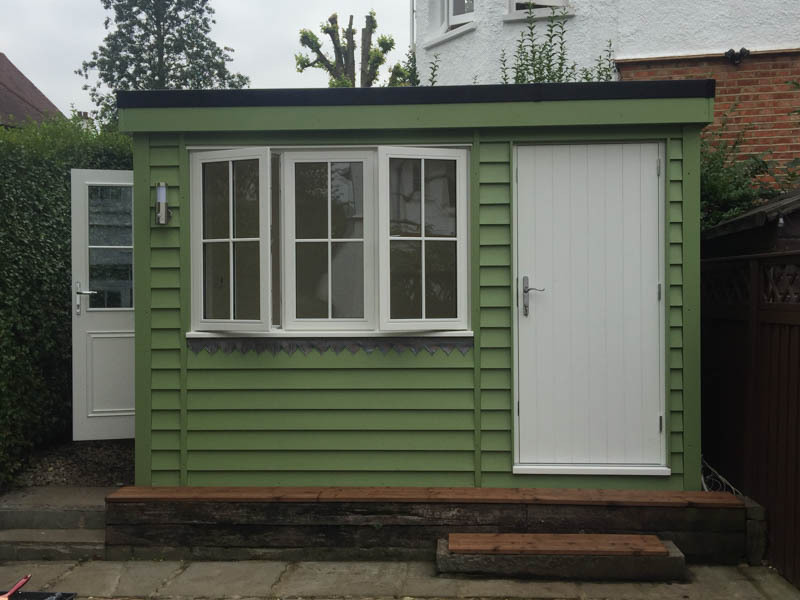 Timeless Garden Rooms customer wanted to replace an old garden shed that sat on a raised area at the end of their garden with a garden office that incorporated a storage shed. The customer decided that they wanted to mix the traditional style of a painted building with a modern mono pitched roof rather than a dual pitch. The Timeless Garden Rooms team were happy to accommodate their wishes into the design. Having taken down an old garden shed, an area was still required to store garden equipment etc. A small office and storage shed have been created, sitting side by side under the one roof. Each room has its own entrance, the door to the storage shed is on the front elevation while the half-glazed door to the office is on the side elevation. The home office that has been created is compact in size, but thanks to the half glazed door and large casement window on the front wall, it is flooded with natural light creating a bright, airy space. The Timeless Garden Rooms team have used timber sleepers to disguise the raised base at the end of the end of the garden where the new building sits. They have also used them to create steps leading up to the storage shed. This building is a good example of how you can mix traditional design elements with more modern elements, in this case, the mono-pitched roof. To learn more about this project talk to the Timeless Garden Rooms team on 01843 821 851 or take a look at their website.